Patricia Sue Head Summitt was born on June 14, 1952. As a youngster, her time was consumed with school work, farm chores, and playing basketball in the hayloft with her brothers. She could chop tobacco, plow a field and bale hay. Hard work was the backbone of the Head family success, but being a good student was just as important - “Trish” never missed a day of school from kindergarten through high school. “My parents taught me a long time ago that you win in life with people,” Summitt said. “And that’s important, because if you hang with winners, you stand a great chance of being a winner.” She has always been an intense, demanding, focused, bright-bluesteely-eyed competitor who is also a very caring, family-oriented person who enjoys a great walk on the beach with the family dogs, Sally Sue and Sadie, or assembling a good ole southern home-cooked meal for her team. Now diagnosed with early onset dementia, Alzheimer’s Type, Summitt does not know what the future entails but this coach won’t let the “D” on dementia diminish her courage, conviction or determination. In so many ways, she is more than just a coach. She would be the first to tell you that her success was due to the players who represented Lady Vol basketball since she came on board as the head coach as a 22-year old in 1974 at The University of Tennessee. She is an educator and role model to the players, a student of the ever-changing game and probably the greatest coach ever in collegiate history; especially having won the most collegiate basketball games recorded in men’s or women’s basketball. 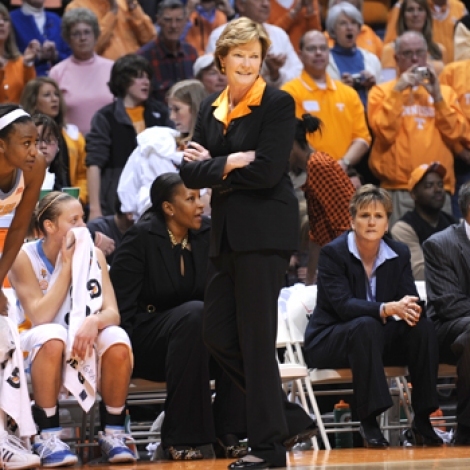 Her players speak of the opportunities afforded them later in life with a degree in life lessons from Summitt in conjunction with a diploma from Tennessee. It seemed only fitting that Summitt achieved the incredible milestone of 1,000 career wins against long-time foe coach Andy Landers and his Georgia Lady Bulldogs in a Southeastern Conference regular season clash at home on “The Summitt.” And, of course, there is the incredible graduation rate of her players and the successes they have garnered in life long after their playing days were over at Tennessee. Every Lady Vol who completed her eligibility at UT under Summitt’s watch received their degree. Summitt instilled a pattern of success in her players and constantly challenged them to reach their potential as a student and an athlete. 72% of those all-time players have gone on to be decorated as Olympians, All-Americans, USA National Team members, All-SEC performers, Academic All-Americans, etc. To her University, she is a goodwill ambassador and took her teams to play basketball in more than 40 states and 11 foreign countries. And the resume she created along with an outstanding cast of players and staff was amazing. Thirty-eight seasons as a proven winner, champion, master motivator and role model. For nearly four decades, the University of Tennessee Lady Vol basketball program has been among the nation’s elite and, in the process, has changed the way women’s collegiate hoops is perceived across the country. Few have even come close to accomplishing what she did for 38 years as head coach (1974-2012). To her peers, she is forthright, well-respected, ethical, and a winner who serves as a shining example in the sport of collegiate basketball and beyond. Pat Head Summitt, head coach emeritus of the University of Tennessee Lady Volunteer basketball team, who concluded a 38-year tenure at the helm of the Lady Vols last year, with a 1,098-208 overall record after raising the bar in the collegiate basketball world, commanded attention every time she stepped out on the court. Recently, Summitt bared her deep courage, as she bravely revealed the toughest opponent she will ever have to battle, early onset dementia, “Alzheimer’s Type,” after the doctors at the Mayo Clinic diagnosed her at the age of 59.